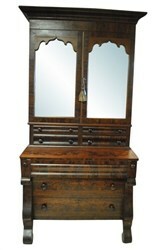 Absolutely fantastic circa 1830’s antique empire secretary bookcase. Ready for a museum, do you want excellence for your home? The cornice tops the conforming case of flaming mahogany. The 2 scalloped and arched mirror doors open to the bookcase with the original locking hardware. Next are 4 storage drawers above the folding desk top with booked and butted flaming mahogany. The surface has the original felt and the weight is supported by 2 pull-out lopers. The bottom case has 1 small drawer, then 2 larger drawers with pulls. All drawers have hand cut dovetailing and operate easily. Atlanta. Excellent condition.